Bristol is a city and county in South West England with a population of 454,200 in 2017. The district has the 10th largest population in England, while the Bristol metropolitan area is the 12th largest in the United Kingdom. The city borders North Somerset and South Gloucestershire, with the cities of Bath and Gloucester to the south-east and north-east, respectively. Bristol's modern economy is built on the creative media, electronics and aerospace industries, and the city-centre docks have been redeveloped as centres of heritage and culture. The city has the largest circulating community currency in the U.K.- the Bristol pound, which is pegged to the Pound sterling. The city has two universities, the University of Bristol and the University of the West of England, and a variety of artistic and sporting organisations and venues including the Royal West of England Academy, the Arnolfini, Spike Island, Ashton Gate and the Memorial Stadium. It is connected to London and other major UK cities by road, rail, sea and air by the M5 and M4 (which connect to the city centre by the Portway and M32), Bristol Temple Meads and Bristol Parkway mainline rail stations, and Bristol Airport. The port developed in the 11th century around the confluence of the Rivers Frome and Avon, adjacent to Bristol Bridge just outside the town walls. By the 12th century Bristol was an important port, handling much of England's trade with Ireland, including slaves. The stone bridge built in 1247 was replaced by the current bridge during the 1760s. The town incorporated neighbouring suburbs and became a county in 1373, the first town in England to be given this status. During this period, Bristol became a shipbuilding and manufacturing centre. By the 14th century Bristol, York and Norwich were England's largest medieval towns after London. One-third to one-half the population died in the Black Death of 1348–49, which checked population growth, and its population remained between 10,000 and 12,000 for most of the 15th and 16th centuries. During the 15th century Bristol was the second most important port in the country, trading with Ireland, Iceland and Gascony. It was the starting point for many voyages, including Robert Sturmy's (1457–58) unsuccessful attempt to break the Italian monopoly of Eastern Mediterranean trade. New exploration voyages were launched by Venetian John Cabot, who in 1497 made landfall in North America. A 1499 voyage, led by merchant William Weston of Bristol, was the first expedition commanded by an Englishman to North America. During the first decade of the 16th century Bristol's merchants undertook a series of exploration voyages to North America and even founded a commercial organisation, 'The Company Adventurers to the New Found Land', to assist their endeavours. However, they seem to have lost interest in North America after 1509, having incurred great expenses and made little profit. Fishermen from Bristol, who had fished the Grand Banks of Newfoundland since the 15th century, began settling Newfoundland permanently in larger numbers during the 17th century, establishing colonies at Bristol's Hope and Cuper's Cove. Because of Bristol's nautical environment, maritime safety was an important issue in the city. During the 19th century, Samuel Plimsoll, known as "the sailor's friend," campaigned to make the seas safer; shocked by overloaded vessels, he successfully fought for a compulsory load line on ships. 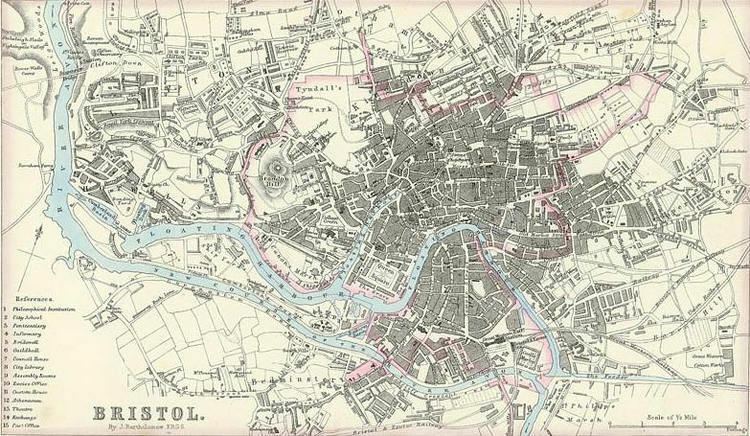 From a population of about 330,000 in 1901, Bristol grew steadily during the 20th century, peaking at 428,089 in 1971. Its Avonmouth docklands were enlarged during the early 1900s by the Royal Edward Dock. Another new dock, the Royal Portbury Dock, opened across the river from Avonmouth during the 1970s. As air travel grew in the first half of the century, aircraft manufacturers built factories. Bristol was heavily damaged by Luftwaffe raids during World War II; about 1,300 people living or working in the city were killed and nearly 100,000 buildings were damaged, at least 3,000 beyond repair. The original central market area, near the bridge and castle, is now a park containing two bombed churches and fragments of the castle. A third bomb-damaged church nearby, St Nicholas, has been restored and is a museum housing a 1756 William Hogarth triptych painted for the high altar of St Mary Redcliffe. The museum also has statues of King Edward I (moved from Arno's Court Triumphal Arch) and King Edward III (taken from Lawfords' Gate in the city walls when they were demolished about 1760), and 13th-century statues of Robert, 1st Earl of Gloucester (builder of Bristol Castle) and Geoffrey de Montbray (who built the city's walls) from Bristol's Newgate. The rebuilding of Bristol city centre was characterised by 1960s and 1970s skyscrapers, mid-century modern architecture and road improvements. Beginning in the 1980s some main roads were closed, the Georgian-era Queen Square and Portland Square were restored, the Broadmead shopping area regenerated, and one of the city centre's tallest mid-century towers was demolished. Bristol's road infrastructure changed dramatically during the 1960s and 1970s with the development of the M4 and M5 motorways, which meet at the Almondsbury Interchange just north of the city and link Bristol with London (M4 eastbound), Swansea (M4 westbound across the Severn Estuary), Exeter (M5 southbound) and Birmingham (M5 northbound). The 20th century relocation of the docks to Avonmouth Docks and Royal Portbury Dock, 7 miles (11 km) downstream from the city centre, has allowed the redevelopment of the old dock area (the Floating Harbour). Although the docks' existence was once in jeopardy (since the area was seen as a derelict industrial site), the inaugural 1996 International Festival of the Sea held in and around the docks affirmed the area as a leisure asset of the city. Bristol City council consists of 70 councillors representing 35 wards, with two per ward serving four-year terms. Councillors are elected in thirds, with elections held in three years out of every four-year period. Thus, since wards do not have both councillors up for election at the same time, two-thirds of the wards participate in each election. Although the council was long dominated by the Labour Party, the Liberal Democrats have grown strong in the city and (as the largest party) took minority control of the council after the 2005 election. In 2007, Labour and the Conservatives united to defeat the Liberal Democrat administration; Labour ruled the council as a minority administration, with Helen Holland as council leader. In February 2009, the Labour group resigned and the Liberal Democrats took office with a minority administration. In the 4 June 2009 council elections the Liberal Democrats gained four seats and, for the first time, overall control of the city council. In 2010 they increased their representation to 38 seats, giving them a majority of 6. In 2011 they lost their majority, leading to a hung council. In the 2013 local elections, in which a third of the city's wards were up for election, Labour gained 7 seats and the Green party doubled their seats from 2 to 4. The Liberal Democrats lost 10 seats. Bristol constituencies in the House of Commons also included parts of other local authority areas until the 2010 general election, when their boundaries were aligned with the county boundary. The city is divided into Bristol West, East, South and North West. Since the 2015 election, the city has had three Labour members of parliament (MPs) and one Conservative. The city has a tradition of political activism. Edmund Burke, MP for the Bristol constituency for six years beginning in 1774, insisted that he was a member of parliament first and a representative of his constituents' interests second. Women's-rights advocate Emmeline Pethick-Lawrence (1867–1954) was born in Bristol, and left-wing politician Tony Benn was MP for Bristol South East in 1950–1960 and 1963–83. In 1963 the Bristol Bus Boycott, following the Bristol Omnibus Company's refusal to hire black drivers and conductors, drove the passage of the UK's 1965 Race Relations Act. The 1980 St. Pauls riot protested against racism and police harassment and showed mounting dissatisfaction with the social and economic circumstances of the city's Afro-Caribbean residents. Local support of fair trade was recognised in 2005, when Bristol became a Fairtrade zone. Bristol is both a city and a county, since Edward III granted it a county charter in 1373. The county was expanded in 1835 to include suburbs such as Clifton, and it was named a county borough in 1889 when that designation was introduced. On 1 April 1974, Bristol became a local government district of the county of Avon. The city regained its independence and county status on 1 April 1996, when Avon was abolished and Bristol became a unitary authority. A slightly broader definition used by the Office for National Statistics (ONS) includes developed areas adjoining Bristol but outside the city-council boundary, such as Whitchurch village, Filton, Patchway and Bradley Stoke, but excludes undeveloped areas within that boundary. The ONS has defined a Bristol Urban Area, which includes Kingswood, Mangotsfield, Stoke Gifford, Winterbourne, Frampton Cotterell, Almondsbury and Easton in Gordano. The North Fringe of Bristol, a developed area in South Gloucestershire between the Bristol city boundary and the M4 and M5 motorways, was so named as part of a 1987 plan prepared by the Northavon District Council. The term Greater Bristol, used by the Government Office of the South West (now abolished), the Office for National Statistics and others, refers to the city and portions of the three neighbouring local authorities‍—‌Bath and North East Somerset, North Somerset and South Gloucestershire‍—‌an area sometimes called the "former Avon area" or the West of England Partnership (WEP) area. Greater Bristol does not include Bath or Weston-super-Mare, which are included in the WEP area. The Friends of Suburban Bristol Railways (FOSBR) conflates the terms Greater Bristol and Suburban Bristol. Bristol is 106 miles west of London and 77 miles south-southwest of Birmingham. It is also 26 miles east of the Welsh Capital Cardiff and 60 miles east-southeast of Swansea. Located in southern England, Bristol is one of the warmest cities in the UK with a mean annual temperature of approximately 10.5 °C (50.9 °F). It is among the sunniest, with 1,541–1,885 hours of sunshine per year. Although the city is partially sheltered by the Mendip Hills, it is exposed to the Severn Estuary and the Bristol Channel. Annual rainfall increases from north to south, with totals north of the Avon in the 600–900 mm (24–35 in) range and 900–1,200 mm (35–47 in) south of the river. Rain is fairly evenly distributed throughout the year, with autumn and winter the wetter seasons. The Atlantic Ocean influences Bristol's weather, keeping its average temperature above freezing throughout the year, but winter frosts are frequent and snow occasionally falls from early November to late April. Summers are warm and drier, with variable sunshine, rain and clouds, and spring weather is unsettled. 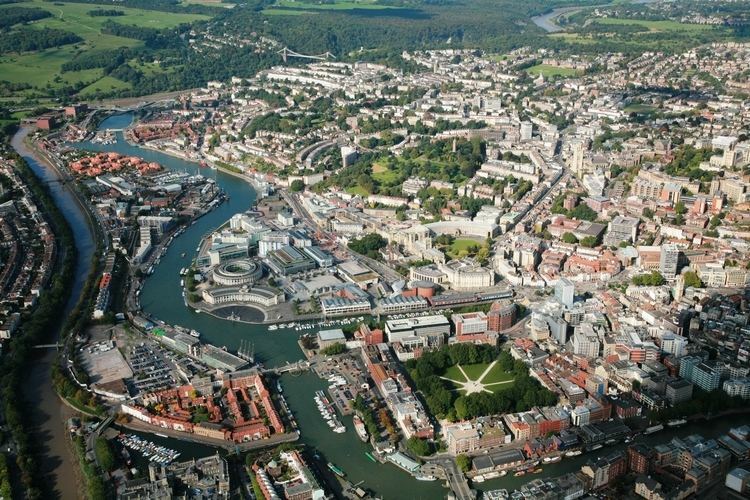 Bristol was ranked as Britain's most-sustainable city (based on its environmental performance, quality of life, future-proofing and approaches to climate change, recycling and biodiversity), topping environmental charity Forum for the Future's 2008 Sustainable Cities Index. Local initiatives include Sustrans (creators of the National Cycle Network, founded as Cyclebag in 1977) and Resourcesaver, a non-profit business established in 1988 by Avon Friends of the Earth. In 2014 The Sunday Times named it as the best city in Britain in which to live. The city received the 2015 European Green Capital Award, becoming the first UK city to receive this award. In 2014, the Office for National Statistics estimated the Bristol unitary authority's population at 442,474, making it the 43rd-largest ceremonial county in England. The ONS, using Census 2001 data, estimated the city's population at 441,556 and that of the contiguous urban area at 551,066. In 2006 the ONS estimated Bristol's urban-area population at 587,400, making it England's sixth-most-populous city and ninth-most-populous urban area. At 3,599 inhabitants per square kilometre (9,321/sq mi) it has the seventh-highest population density of any English district. According to the 2011 census, 84% of the population was White (77.9% White British, 0.9% White Irish, 0.1% Gypsy or Irish Travellers and 5.1% Other White); 3.6% mixed-race (1.7% white-and-black Caribbean, 0.4% white-and-black African, 0.8% white and Asian and 0.7% other mixed); 5.5% Asian (1.5% Indian, 1.6% Pakistani, 0.5% Bangladeshi, 0.9% Chinese and one percent other Asian); 6% Black (2.8% African, 1.6% Caribbean, 1.6% Other Black), 0.3% Arab and 0.6% with other heritage. Bristol is unusual among major British towns and cities in its larger black than Asian population. These statistics apply to the Bristol Unitary Authority area, excluding areas of the urban area (2006 estimated population 587,400) in South Gloucestershire, Bath and North East Somerset (BANES) and North Somerset—such as Kingswood, Mangotsfield, Filton and Warmley. 56.2% of the 209,995 Bristol Residents who are employed commute to work using either a car, van, motorbike or Taxi. While 2.2% commute by rail and 9.8% by bus, 19.6% walk. The city's economy also relies on the aerospace, defence, media, information technology, financial services and tourism industries. The Ministry of Defence (MoD)'s Procurement Executive, later known as the Defence Procurement Agency and Defence Equipment and Support, moved to its headquarters to Abbey Wood, Filton, in 1995. This organisation, with a staff of 7,000 to 8,000, procures and supports MoD equipment. 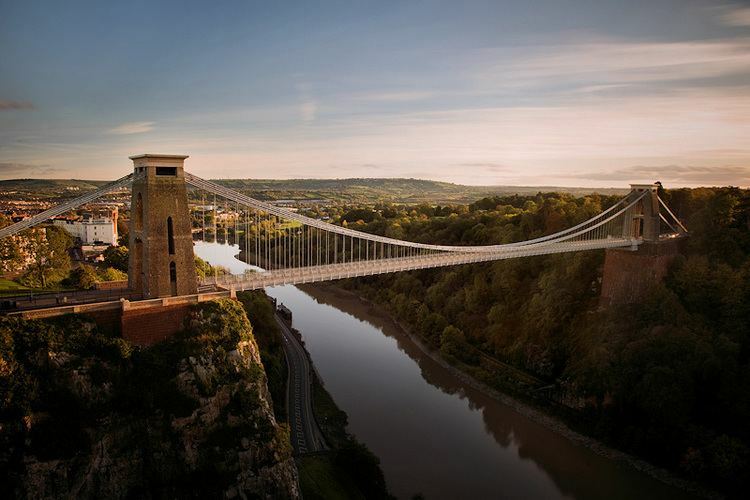 One of the UK's most popular tourist destinations, Bristol was selected in 2009 as one of the world's top-ten cities by international travel publishers Dorling Kindersley in their Eyewitness guides for young adults. Bristol is one of the eight largest regional English cities that make up the Core Cities Group, and is ranked as a gamma world city by the Globalization and World Cities Research Network, the fourth highest ranked English city. In 2014 Bristol's gross domestic product was £30.502 billion. Its per capita GDP was £46,000 ($65,106, €57,794), which was some 65% above the national average, the third highest of any English city (after London and Nottingham) and the sixth highest of any city in the United Kingdom (behind London, Edinburgh, Glasgow, Belfast and Nottingham). Bristol's March 2007 unemployment rate was 4.8%, compared with four percent for South West England and the national average of 5.5%. Bristol has a thriving current and historical arts scene. Some of the modern venues and modern digital production companies have merged with legacy production companies based in old buildings around the city. In 2008 the city was a finalist for the 2008 European Capital of Culture, although the title was awarded to Liverpool. The city has many venues for live music, its largest the 2,000-seat Colston Hall named after Edward Colston. Others include the Bristol Academy, The Fleece, The Croft, the Exchange, Fiddlers, the Victoria Rooms, Trinity Centre, St George's Bristol and several pubs, from the jazz-oriented The Old Duke to rock at the Fleece and indie bands at the Louisiana. 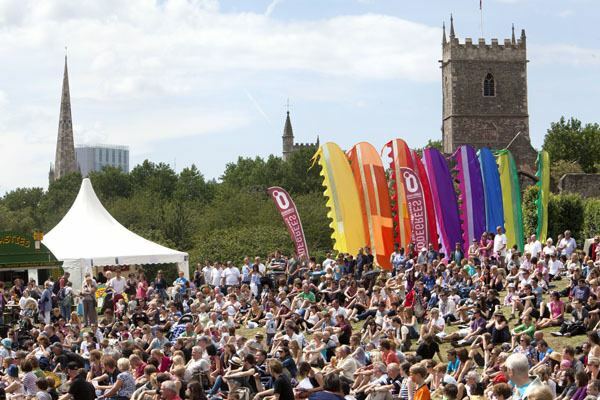 In 2010 PRS for Music called Bristol the UK's most musical city, based on the number of its members born there relative to the city's population. 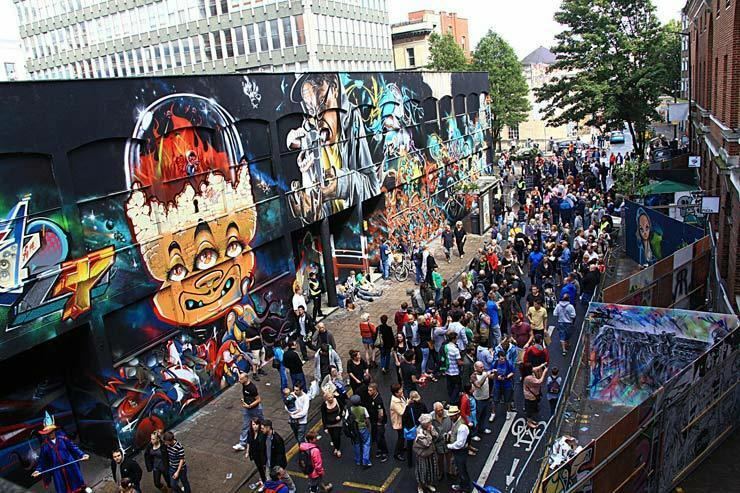 Since the late 1970s Bristol has been home to bands combining punk, funk, dub and political consciousness, and trip hop and Bristol Sound artists such as Tricky, Portishead and Massive Attack; the list of bands from Bristol is extensive. The city is a stronghold of drum and bass, with artists such as Roni Size's Mercury Prize-winning Reprazent, as DJ Krust and More Rockers. This music is part of the Bristol urban-culture scene which received international media attention during the 1990s. The Watershed Media Centre and Arnolfini gallery (both in dockside warehouses) exhibit contemporary art, photography and cinema, and the city's oldest gallery is at the Royal West of England Academy in Clifton. The nomadic Antlers Gallery opened in 2010, moving into empty spaces on Park Street, on Whiteladies Road and in the Purifier House on Bristol's Harbourside. Stop motion animation films and commercials (produced by Aardman Animations) are made in Bristol. Bristol is home to the regional headquarters of BBC West and the BBC Natural History Unit. Locations in and around Bristol have featured in the BBC's natural-history programmes, including Animal Magic (filmed at Bristol Zoo). The oldest Grade I listed buildings in Bristol are religious. St James' Priory was founded in 1129 as a Benedictine priory by Earl Robert of Gloucester, the illegitimate son of Henry I. The second oldest is Bristol Cathedral and its associated Great Gatehouse. Founded in 1140, the church became the seat of the bishop and cathedral of the new Diocese of Bristol in 1542. Most of the medieval stonework, particularly the Elder Lady Chapel, is made from limestone taken from quarries around Dundry and Felton with Bath stone being used in other areas. Amongst the other churches included in the list is the 12th century St Mary Redcliffe which is the tallest building in Bristol. The church was described by Queen Elizabeth I as "the fairest, goodliest, and most famous parish church in England." Bristol has teams representing all the major national sports. Bristol City and Bristol Rovers are the city's main football clubs. Bristol Rugby (Rugby Union) and Gloucestershire County Cricket Club are also based in the city. The two Football League clubs are Bristol City and Bristol Rovers‍—‌the former being the only club from the city to play in the precursor to the Premier League. Non-league clubs include Bristol Manor Farm, Hengrove Athletic and Brislington. Bristol City, formed in 1897, were Division One runners-up in 1907 and lost the FA Cup final in 1909. In the First Division in 1976, they then sank to the bottom professional tier before reforming after a 1982 bankruptcy. Bristol City were promoted to the second tier of English football in 2007, losing to Hull City in the playoff for promotion to the Premier League that season. Bristol Rovers, the oldest professional football team in the city, were formed in 1883 and promoted back into the football league in 2015. They were third-tier champions twice (Division Three South in 1952–53 and Division Three in 1989–90), Watney Cup Winners (1972) and runners-up for the Johnstone's Paint Trophy (2006–07) although have never played in England's top Division. The club has planning permission for a new 21,700-capacity all-seater stadium at the University of the West of England's Frenchay campus. Construction was due to begin in mid-2014, but in March 2015 the sale of the Memorial Stadium site (needed to finance the new stadium) was in jeopardy. Bristol Academy Women's Football Club is based at South Gloucestershire and Stroud College. The city is also home to Bristol Rugby, formed in 1888 as Bristol Football Club by the merger of the Carlton club with rival Redland Park. Westbury Park declined the merger and folded, with many of its players joining Bristol. Bristol Rugby has often competed at the highest level of the sport since its formation in 1888. The club played at the Memorial Ground, which it shared with Bristol Rovers from 1996. Although Bristol Rugby owned the stadium when the football club arrived, a decline in the rugby club's fortunes led to a transfer of ownership to Bristol Rovers. In 2014 Bristol Rugby moved to their new home, Ashton Gate Stadium (home to Bristol Rovers' rivals Bristol City), for the 2014–15 season. Dating from 1901, the Bristol Combination and its 53 clubs promote rugby union in the city and help support Bristol Rugby. The most prominent of Bristol's smaller rugby clubs include Clifton Rugby, Dings Crusaders, and Cleve. Rugby league is represented in Bristol by the Bristol Sonics. The first-class cricket club Gloucestershire County Cricket Club has its headquarters and plays the majority of its home games at the Bristol County Ground, the only major international sports venue in the south west of England. It was formed by the family of W. G. Grace. The club is arguably Bristol's most successful, achieving a period of success between 1999 and 2006 when it won nine trophies and became the most formidable one-day outfit in England, including winning a "double double" in 1999 and 2000 (both the Benson and Hedges Cup and the C&G Trophy), and the Sunday League in 2000. Gloucestershire CCC also won the Royal London One-Day Cup in 2015. A dialect of English, known as Bristolian, Bristolese, Brizzle or Bristle (after the publication of Derek Robson's "Krek Waiters peak Bristle") is spoken by longtime residents, who are known as Bristolians. Bristol natives have a rhotic accent, in which the post-vocalic r in "car" and "card" is pronounced (unlike in Received Pronunciation). The unique feature of this accent is the "Bristol (or terminal) l", in which l is appended to words ending in a or o. Whether this is a broad l or a w is a subject of debate, with "area" pronounced "areal" or "areaw". The ending of "Bristol" is another example of the Bristol l. Bristolians pronounce -a and -o at the end of a word as -aw (cinemaw). To non-natives, the pronunciation suggests an l after the vowel. DJ Mag's top 100 club list ranked Motion as the 19th best club in the world in 2016. This is up 5 spots from 2015. Motion is host to some of the world's top DJs, and leading producers. Motion is a complex made up of different rooms, outdoor space and a terrace that looks over the river Avon. In 2011 Motion was transformed from a skate park, into the rave spot it is today. In:Motion is an annual series which takes place each autumn and delivers 12 weeks of music and dancing. The club, on Avon Street, behind Temple Meads train station, does not limit itself to playing one genre of music. Party-goers can hear everything from disco, house, techno, grime, drum and bass or hip hop, depending on the night. Lakota, Thekla, and Blue Mountain are other clubs in the city. Mr. Wolf's is a family run business located in Bristol's City Centre that has existed for over 14 years. The venue hosts live bands and DJs 7 nights a week, as well as weekly open-mic nights. The venue has also hosted burlesque, live graffiti and comedy performances, and provides a simple menu of noodle dishes. The Attic Bar is a venue located in Stokes Croft. The bar is equipped with a sound system and stage which are used every weekend for gigs of every genre. Adjacent to The Attic Bar is The Full Moon pub and backpacker's hostel. These buildings are joined by a courtyard, used for getting fresh air, or a cigarette. The Guardian, a British daily paper, ranked The Attic Bar as one of the top ten clubs in the UK. Hyde and Co is a speakeasy-style bar located near the Clifton Triangle. It is a small dark bar with an unmarked entrance. This bar has a menu of cocktails inspired by the Prohibition era, and offers master-classes to share their recipes with the public. Hyde and Co has a sister bar, called Milk Thistle which is also Prohibition era themed. Milk Thistle has 4 floors: a cocktail bar, a lounge, and private function rooms. The Apple is a cider bar located by Bristol's harbour side. Opened in 2004, this bar floats on water, as it was originally a Dutch barge. The Apple offers a range of 40 different ciders and cider related drinks, in addition to wine, beer, spirits and food. In 2014, the Great British Pub Awards, ranked The Apple as the best cider bar in the UK. Its quayside terrace and deck bar, make for a perfect hangout spot on a warm summer day, as recognized by the Guardian. Small Bar is a craft beer bar located in Central Bristol. It opened in December 2013, and has 31 taps in total. Some beers are brewed on the premises, while others are taken from small companies, and independent breweries. Only halves, thirds, and two thirds glasses are served because the owners want their customers to be able to try as many beers as possible, and to ensure customers can finish their beer before it gets warm. In October 2016, Small Bar opened in Cardiff, Wales. Small Bar also serves food; its menu is short and experimental and rotates every few weeks. Bristol has two major institutions of higher education: the University of Bristol, a "redbrick" chartered in 1909, and its main building opened in 1925. A polytechnic university opened in 1969, giving the city a second institute of higher education which became the University of the West of England in 1992. The University of Law also has a campus in the city. Bristol has two further education institutions (City of Bristol College and South Gloucestershire and Stroud College) and three theological colleges: Trinity College, Wesley College and Bristol Baptist College. The city has 129 infant, junior and primary schools, 17 secondary schools, and three learning centres. After a section of north London, Bristol has England's second-highest number of independent-school places. Independent schools in the city include Clifton College, Clifton High School, Badminton School, Bristol Grammar School, Redland High School, Queen Elizabeth's Hospital (the only all-boys school) and the Red Maids' School (founded in 1634 by John Whitson, which claims to be England's oldest girls' school). In 2005 Chancellor of the Exchequer Gordon Brown named Bristol one of six English "science cities", and a £300 million science park was planned at Emersons Green. Research is conducted at the two universities, the Bristol Royal Infirmary and Southmead Hospital, and science is demonstrated at At-Bristol, the Bristol Zoo, the Bristol Festival of Nature and the Create Centre. The city has produced a number of scientists, including 19th-century chemist Humphry Davy (who worked in Hotwells). Physicist Paul Dirac (from Bishopston) received the 1933 Nobel Prize for his contributions to quantum mechanics. Cecil Frank Powell was the Melvill Wills Professor of Physics at the University of Bristol when he received the 1950 Nobel Prize for, among other discoveries, his photographic method of studying nuclear processes. Colin Pillinger was the planetary scientist behind the Beagle 2 project, and neuropsychologist Richard Gregory founded the Exploratory (a hands-on science centre which was the predecessor of At-Bristol). Bristol has two principal railway stations. Bristol Temple Meads (near the city centre) has Great Western Railway services which includes high-speed trains to London Paddington and local, regional and CrossCountry trains. Bristol Parkway, north of the city centre, has high-speed Great Western Railway services to Swansea, Cardiff Central and London Paddington and CrossCountry services to Birmingham and the North East. Limited service to London Waterloo via Clapham Junction from Bristol Temple Meads is operated by South Western Railway, and there are scheduled coach links to most major UK cities. The runway, terminal and other facilities at Bristol Airport (BRS), Lulsgate, have been upgraded since 2001. Public transport in the city consists primarily of a First West of England bus network. Other providers are Abus, Stagecoach West, Stagecoach South West and Wessex Bus. Bristol's bus service has been criticised as unreliable and expensive, and in 2005 FirstGroup was fined for delays and safety violations. Private car use is high in the city, leading to traffic congestion costing an estimated £350 million per year. Bristol allows motorcycles to use most of the city's bus lanes and provides secure, free parking for them. Although the city council has included a light rail system in its local transport plan since 2000, it has not yet funded the project; Bristol was offered European Union funding for the system, but the Department for Transport did not provide the required additional funding. The most recent light rail proposal was put forward as part of a consultation produced by the West of England Local Enterprise Partnership in November 2016, outlining potential light rail/tram routes from the city centre to Bristol Airport, the eastern and north west fringes of the city, and a route along the A4 road to Bath. In 2017, a further feasibility study will be undertaken into the possibility of an underground light rail system. A new bus rapid transit system (BRT) called MetroBus, is currently under construction across Bristol, as of 2015, to provide a faster and reliable service than buses, improve transport infrastructure and reduce congestion. The MetroBus rapid transit scheme will run on both bus lanes and segregated guided busways on three routes; Ashton Vale to Temple Meads (AVTM), North Fringe to Hengrove and South Bristol Link (SBL). MetroBus services are expected to start in 2017. Several road-construction plans, including re-routing and improving the South Bristol Ring Road, are supported by the city council. Three park and ride sites serve Bristol. The city centre has water transport operated by Bristol Ferry Boats, Bristol Packet Boat Trips and Number Seven Boat Trips, providing leisure and commuter service in the harbour. Bristol's principal surviving suburban railway is the Severn Beach Line to Avonmouth and Severn Beach. Although Portishead Railway's passenger service was a casualty of the Beeching cuts, freight service to the Royal Portbury Dock was restored from 2000 to 2002 with a Strategic Rail Authority rail-freight grant. The MetroWest scheme, formerly known as The Greater Bristol Metro, proposes to increase the city's rail capacity as well as the restoration of a further 3 miles (5 km) of track to Portishead (a dormitory town with one connecting road), despite concerns about insufficient funds to rebuild stations, is scheduled for completion by 2019. A further commuter rail line from Bristol Temple Meads to Henbury is due to open in 2021. Bristol was designated as England's first "cycling city" in 2008 and is home to Sustrans, the sustainable transport charity. The city has urban cycle routes and links with National Cycle Network routes to Bath, London, Gloucester, Wales and South West England. Cycling trips have increased by 21% from 2001 to 2005.